Benchmark Email has a long history with non-profits, including our own We Care About Kids program. It was an obvious choice to turn our focus to non-profits for this month’s guest blogger series. I present to you, Presence for Non-Profits. We’ve got a great group of talented writers to share their knowledge and expertise with all of you. 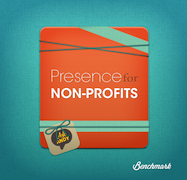 To help spread the word on Presence for Non-Profits, we’re holding yet another giveaway. All you have to do is ReTweet any of the Presence for Non-Profits blog posts (this one included). Each individual RT counts as another entry for the contest. You must be following @BenchmarkEmail on Twitter to be eligible to win. The contest will run from September 21st through Monday, October 1st at 9:00 AM PST. ReTweet any Presence for Non-Profits blog post to be entered to win. Each ReTweet counts as a new entry to the Kindle Fire giveaway. You can RT a post more than once, but please do not spam your followers. Benchmark Email does not support SPAM in any way, shape or form and overdoing it with the RTs will result in your disqualification of eligibility for the Kindle Fire. You must be following @BenchmarkEmail on Twitter to be eligible to win. I am following and tweeted and retweeted @VestaJMason! Thanks SO much for the chance to win!! !